In his book, The Visual Display of Quantitative Information, Edward Tufte argues for the maximisation (within reason) of non-redundant data-ink which shows variation in the numbers represented, and the minimisation of other ink. This implies that non-data-ink and redundant data-ink should be deleted where reasonable, and the remaining ink used to represent as much new information as possible. From these principles, Tufte suggests redesigning several types of graphs and this page describes my implementation of some of the ideas presented, using GNU R. I have mainly concentrated on the scatterplot, although the redesign of axes is applicable to many types of charts, for example I have used it on histograms and time-series plots. If you would like to try it out for yourself, the source is available under the GPL license. Draws an axis showing information about the marginal distribution of a variable. Jitters a vector while preserving the minimum and maximum. Draws a rug plot, but omits the baseline normally included in R rug plots. Draws a bar plot on an axis, showing the marginal distribution of the respective variable. 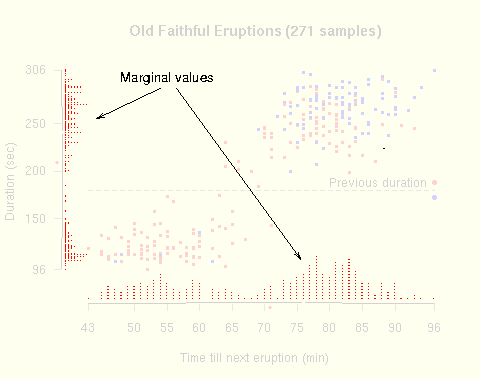 The diagrams below show examples of these functions, using the faithful dataset provided with R. This lists 272 eruption durations and the time till next eruption, of the Old Faithful geyser in Yellowstone National Park, Wyoming, USA. The example code used to generate them is also available. The axis baseline is truncated to the range of the variable, and tick marks are put at the position of the minimum and maximum values. The label for these tick marks has a greater precision to indicate that these are actual data items rather than ordinary points on the scale. In this example the implied precision is unjustified, as the data was not recorded to 5 significant figures, but zero padding is shown for illustration. The 1st and 3rd quartiles are indicated by shifting the axis baseline and the median is shown by a gap in the baseline. The mean is indicated by a red dot. The marginal value of each sample is plotted as a rug chart on the respective axis. In this dataset, due to low recorded precision, there are many ties so an unmodified rug chart will not fulfil the purpose of showing density. R provides the jitter() function, which adds random noise to a vector and this could be used to solve the problem. However, using jitter() could shift points outside the original range, which would be noticeable due to the indicated minimum and maximum. For this reason, I have, used clippedjitter(), which performs like jitter(), but it will not modify the minimum or maximum. The R rug() function is based on axis() so draws a baseline in addition to the ticks. This is redundant so I use minimalrug() which will draw only the ticks. This function could also be used by itself to produce the dot-dash plot also suggested by Tufte. As described above, clippedjitter() can be used to display density information of a variable with many ties. However, this is not always ideal, since it hides information about the rounding applied to the data. As an alternative, axisstripchart() draws a bar plot on the axis, showing the frequency distribution of the respective variable. This graph shows the how the fancyaxis() and axisstripchart() functions can be used. In addition, the points have been coloured to increase the dimensionality of the graph. 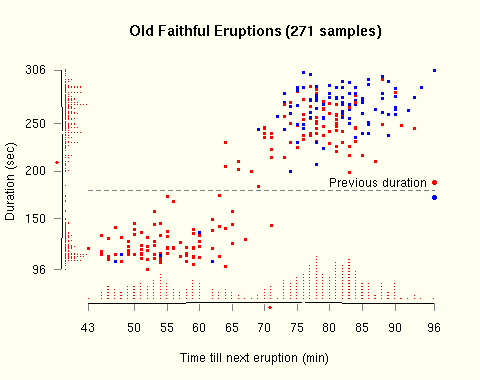 Red indicates that the previous eruption was longer than 180 seconds, blue indicates that it was shorter than 180 seconds. It appears that when one eruption is of the short type (shorter than 180 seconds), the next one will probably be of the long type (longer than 180 seconds). This is apparent from the graph, and is backed up by the numbers. 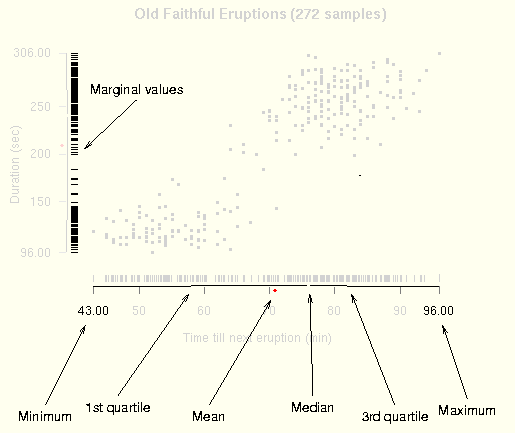 36% of eruptions are short. Where the previous eruption is short, only 6% of eruptions are short, but where the previous eruption is long, 52% of eruptions are short. I have used this style of graph in the paper "Message Splitting Against the Partial Adversary" by Andrei Serjantov and Steven J. Murdoch. The pages showing diagrams are available by themselves, as well as the full paper. Rather than a scatterplot, this consists of time-series plots and histograms of frequency distributions. Still, fancyaxis() and minimalrug() can be used. For the time-series graphs in figure 9, only the Y axis uses the modified axis, as the frequency distribution of sample times is not particularly informative. Similarly, only the X axis has been modified for histograms, as using it on the Y axis would show the frequency distribution of a frequency distribution, which is quite subtle and of dubious value. The rug plot is used on the histograms to show the actual data values and reveal any artifacts which were hidden by allocating values to bins. Finally, in addition to showing the values of the summary, table 1 acts as a key to the modified axes. The functions for drawing the broken axes, jittered rug plot and strip chart can be found in fancyaxis.R. The code used to generate the examples on this webpage can be found in examples.R. The source code is distributed under the GPL, the same license used for the majority of R.
This is very much a work in progress and still of alpha quality. It currently does not fully deal with logarithmic scales and needs manual tweaking of several values to suit different data and output device resolution. Drawing tickmarks and labels is performed by axis(), which always draws a baseline. This is then erased with the background colour so it does not work properly with a transparent background. Also, in some rendering engines of PDF and Postscript output the erasure is not complete and some parts of the baseline are still visible. A reimplementation of axis() in R code was intolerably slow so the full solution would be to modify the C implementing axis(), adding an option to disable the drawing of the baseline. I plan to do this, but it is not yet complete. The code should ideally be placed in a package, rather than a file which is sourced. I plan to do this once the code is more stable and there is proper documentation written. There is more discussion on other graphing software and visualisation techniques, including this package, in a post on the Ask E.T. forum. Comments and suggestions are appreciated. Please see my contact details.